Every day, the news about climate change and the harms that are sure to accompany it gets worse and worse. To many environmentalists, the answer is simple: power shift. That is, shift from fossil fuels to clean, green, renewable, alternative energy. Well-meaning concerned citizens and activists have jumped on the bandwagon. The problem with this simple solution: Things aren’t as simple as they seem, and “there’s actually no such thing as a free lunch” when it comes to energy consumption and production. Further, what we’re often sold as “green” and “clean” is actually neither. 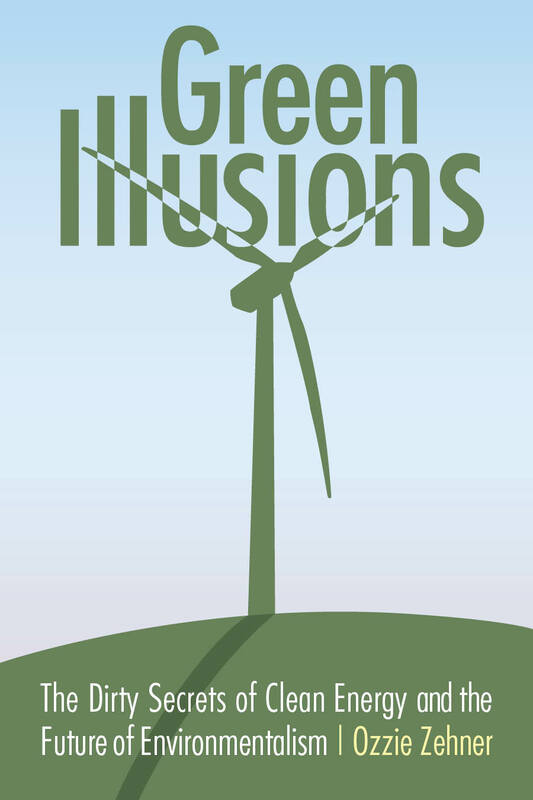 In the spirit of these inconvenient truths came a timely and provocative book, perhaps missed by many, titled, “Green Illusions: The Dirty Secrets of Clean Energy and the Future of Environmentalism,” by Ozzie Zehner. As Zehner writes in the book’s opening pages, “…this certainly isn’t a book for alternative energy. Neither is it a book against it. In fact, we won’t be talking in simplistic terms of for or against, left and right, good and evil … Ultimately, this is a book of shades.” The book does show some of the “shady” sides of the clean energy hype and in so doing, dampens the hype around it. Having recently read the book myself, I decided to contact Ozzie and ask him follow-up questions. Below is a transcript of our email conversation, which unfolded over the past few months. Steve Horn for Truthout: If you had to give an elevator pitch to someone about what’s wrong with the current US environmental movement, what would you say and why? Ozzie Zehner: I would say that the environmental movement has relegated itself to cheerleading and mindless chants and that it’s time for us to step away from the pom-poms. I encounter a boundless enthusiasm for creating positive change when holding dialogues with environmental groups. Unfortunately, the mainstream environmental movement is channeling that energy into an increasingly corporatist, and what I call a “productivist,” set of priorities. Now I admit, it’s difficult to say we’ve ever had a truly transformational environmental movement, but if you go back 50 years, activists were at least on a far better path. Prominent environmentalists were living modestly, challenging dominant economic assumptions, and imagining durable strategies for human prosperity that were more in tune with the non-human planet. That humility has largely eroded. Can wind/solar ever actually replace the fossils or is that the wrong way to think about the energy/climate conversation to begin with? If so, what are some of the right ways to start thinking about this conversation and what can be done to salvage what looks to be increasingly horrific runaway climate change? There is an impression that we have a choice between fossil fuels and clean energy technologies such as solar cells and wind turbines. That choice is an illusion. Alternative energy technologies rely on fossil fuels through every stage of their life. Alternative energy technologies rely on fossil fuels for mining operations, fabrication plants, installation, ongoing maintenance and decommissioning. Also, due to the irregular output of wind and solar, these technologies require fossil fuel plants to be running alongside them at all times. Most significantly, alternative energy financing relies on the kind of growth that fossil fuels drive. Take, for instance, President Obama’s new Energy Security Trust. It aims to expand offshore oil-drilling operations in order to provide a tax base for alternative energy technologies, which will in turn lead to economic growth. The irony in the President’s proposal is that it exposes how alternative technologies rely on economic arrangements that are themselves reliant on fossil fuels. And, if they work as advertised, these energy technologies will spur the kind of growth that will increase pressure to extract and burn fossil fuels well into the future. There’s a misconception that once alternative energy technologies get off the ground, they can fly on their own. But alternative energy technologies are better understood as a product of fossil fuels. It’s notably more expensive to build a wind turbine today than it was a decade ago. Biofuels rely on petrochemical fertilizers and energy-intensive agriculture. And even though subsidies are driving a perceived rapid drop in solar technology costs, the larger expense of an installed solar system lies in installation, cleaning, repair, insurance and other low-tech costs, according to the largest database of field data from California. The high cost of wind and solar technologies brings to light the fossil fuels behind the curtain. If we want to address climate change and the many other consequences of energy production, there’s no evidence that lower energy costs and growth are a step in the right direction. The answer is straightforward, really. We’ll need to greatly reduce both consumption and the number of people consuming over time. You mention “productivist” and “corporatist” both here and in your book. By that do you mean neoliberal? Is the problem that the current green movement, if you want to call it that, has little understanding of the fundamentals of the current socio-economic order? Neoliberalism, the idea that unfettered markets of privatized resources leads to prosperity, is just one human arrangement that falls under the larger umbrella of productivism. It’s tempting to simply focus on critiquing markets and wealth accumulation. There are many injustices in that realm, to be sure. But we might also talk about human procreation, the work ethic, alternative energy production, or numerous other productivist pursuits. Within these narratives runs a common theme – that which is produced is good, and those who produce it should be rewarded. This creates problems on a finite planet, to put it mildly. Libertarians and Tea Partiers subscribe to the free-growth mindset, but so do Democrats and Republicans. Even Greens and Socialists are not immune to the seductive language of productivism. I know of one political candidate in the US who has run on a platform of slowing down the machine in order to preserve long-term prosperity only: Dave Gardner, who ran for mayor of Colorado Springs and directed a movie about it called Growthbusters. We’ve seen material growth and prosperity walking hand-in-hand for so long that we don’t know what they look like separately. That will have to change. Perhaps we’d better reorient, or at least recognize, our productivist inclinations now. Otherwise, Mother Nature may force us to reckon with our unsustainable belief systems in a less agreeable fashion. Guy McPhersen uses the term “fossil fuel derivatives,” which fits into your assessment. Is that a better way of framing the debate: fossil fuels vs. fossil fuel derivatives? There is no “clean energy” then, right? Any “silver bullet” fuel source, or is the “silver bullet” creating a different world? The silver bullet is to envision a prosperous, yet smaller and less-consuming populous. In the modern energy system, alternative energy ends up being an alternative way to burn fossil fuel, which incurs alternative side effects and limitations. I wish it weren’t so, but that’s where the evidence leads. But they are not cheap at all. Even with massive subsidies, we see firms going bankrupt trying to sell them. And then we still have to figure in the cost of building batteries, redundant power plants or other infrastructure that arises from their low quality intermittent energy. Finally, we have to consider the mining, health, pollution and waste problems of renewable technologies. For example, we are now learning that the solar cell industry is one of the fastest growing emitters of virulent greenhouse gases such as sulfur hexafluoride, which has a global warming potential 23,000 times higher than CO2, according to the Intergovernmental Panel on Climate Change (IPCC). There’s no such thing as clean energy, but there is such a thing as less energy. Every energy generation technique has side effects and limitations. The best way to avoid these negative consequences is to use less energy overall. That strategy also has side effects and limitations, but at least those can be addressed within the laws of physics on our finite planet. Do you believe more so in the “end of growth” point of view, espoused by Richard Heinberg and others in that school of thought? What about something like biomass or biochar, the latter of which has been touted by some environmentalists as a form of “black gold“? Will that save our asses or is there hype here? I recently visited a new tree-burning plant on the campus of the University of British Columbia. The university brags about burning trees to fuel their rather inefficient campus buildings. The practice of burning trees goes by many carefully branded names these days: biomass, biochar, sustainable forestry, selective logging, combined heat and power, and others. Biomass proponents in Vancouver told me their plant is 1) CO2 neutral and 2) only burning waste – two of the central talking points that profit-minded industry officials leverage to bring citizens on board. But, as with other forms of marketing, they are engaging in a practice of misdirection. It takes a minute to incinerate a tree in a biomass plant, but it takes decades to grow one. And how can that seedling grow back if you’ve removed the so-called “waste” materials from the forest? Research shows that forests do not grow back to their original state, of course, and that biomass plants exhaust far more CO2 than natural gas or coal plants. If you live on an infinite planet and have a time machine, maybe biomass could be sustainable. However, on our finite world, forests are a depleting resource just like fossil fuels. They are also our lungs. That’s why burning them is the fastest route to civilization collapse. Electric cars? You devote a decent amount of space in your book explaining why they’re not the answer. Why not? There have been two very prominent documentaries which conclude that they’re the saving grace. Fortunately, we have another point of reference to consider. Researchers at The National Academy of Sciences took a step back. They investigated the entire life cycle of an electric car and painstakingly compared its impact to epidemiological data from every county across the United States. They determined that electric cars merely create a different set of side effects. It’s just that those side effects don’t come out of a tailpipe, where we are accustomed to looking for them. Mainstream environmental groups are exchanging their principles for power at a suspect rate of exchange. It’s not just the alternative energy technologies that rely on fossil fuels. The environmental groups do, too. They rely on funding from the excess wealth accumulated as froth on the top of the fossil fuel economy. But it’s not just money. There are other influences too. In addition to the money and magic, there are silo effects. That is, asking narrow questions that can be answered with the methods at hand. We’ve seen a decline in the social science and humanities as ways of knowing something about our world, as if the human spirit and the natural world were materials to be titrated in a test tube. We are afraid to ask questions that can’t be answered by the clever methods we’ve created. Finally, there’s the influence of media, which I spend a whole chapter dissecting in Green Illusions. Green media has become a war of press releases – a contest of half-baked models and glorified science fair experiments. It doesn’t have to be this way. We can change it all if we are willing to think and inquire differently as concerned citizens. What exactly would “de-growth” look like as a movement? Are there examples of communities/nation-states taking part in it now? And do you see any examples of it within the US itself, say, within the Occupy movement? I can’t say exactly what de-growth will look like, but I suspect it will start with a different conceptual landscape. We’ve built up stories around green technologies and we make comparisons that are bound to satisfy those preconceptions. As a result, we have an environmental movement that is asking the wrong questions about growth, economy, equity and global risks. Take, for instance, the practice by mainstream environmental groups of vilifying petroleum cars in order to promote electric cars. No doubt, gas cars are expensive and dirty. They kill tens of thousands of people annually. But using them as a benchmark to judge a technology as green is a remarkably low bar. Even if researchers at the National Academies are wrong – even if electric cars someday pass over that low bar – there’s another problem. How will electric cars stack up against the broader array of transportation options at hand such as transit, cycling and walking? Subsidies for electric cars are ultimately a subsidy to car culture and the infrastructure that goes with it. Car culture is not sustainable within the limits we face to growth. The more durable transportation options are cycling and walking. But the United States Congress has nearly eliminated bike lane and pedestrian funding – even while it pays out thousands of dollars to every wealthy electric car buyer. And Congress staged this tragic national embarrassment with the full support of the nation’s leading environmental organizations. We are so far from finding solutions. We first have to change our questions. We have to stop touting green growth, green jobs, green buildings, green business, and start to interrogate assumptions that undergird the belief that material growth will lead to long-term prosperity. British Columbia’s Work Less Party, along with the French de-growth movement, are shifting to different kinds of questions. Occupy, as a political ideal, is building foundations, too. As the green illusions start to unravel over the coming years, we will find opportunities to create a new environmentalism, or perhaps a rediscovered environmentalism, which I am guessing will be both frustrating and exhilarating. Ozzie Zehner is the author of Green Illusions and a visiting scholar at University of California-Berkeley. Here’s the elevator summary for Zehner: Don’t worry about whether your electricity comes from coal, gas, or solar. The main thing is to live like hippies, and persuade everybody else to do the same. His ideas are absurd and counterproductive. Most people are going to live the way they want to, and artists setting up bicycle communes and building passive houses are just fine with the oil companies. This will not be fine for the planet, though, since it’s a sure path to extinction. If I were Koch, I would hire Zehner.